Mangalore Karnataka - Mangalore is the one of the fastest developing cities of India, located on the coast of the Arabian Sea, at Karnataka State. 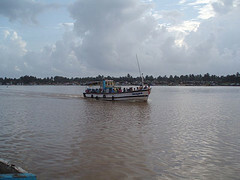 Mangalore or Mangaluru is named after the goddess Mangala Devi. Many languages are spoken here. 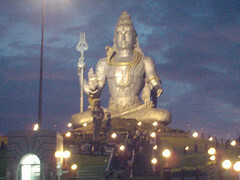 It is the gateway to Karnataka, and a blend of new and old culture. During Hyder Ali's reign, Mangalore Karnataka was a port of great significance and the major seaport and ship building centre.The city has developed at the confluence of the two legendary river's, the Nethravathi and the Gurupura river. This beautiful place is dotted with coconut palms, hills and streams, and is known for its temples and beaches. The Kudroli Sri Gokarnanatheshwara Temple, 3kms from the city, is an important landmark. This beautiful temple was built in 1912 in the Tamil Nadu style, by Sri Narayana Guru. It is the abode of Lord Gokarnanatha, another name for Lord Siva. The temple has four gopuras decorated with murals of various gods and goddesses. Murals also depict various scenes from epics and legends. The main festivals celebrated are Navaratri and Shivratri. The dasara celebrations of this temple is also popularly called as Mangalore Dasara. Mangala Devi Temple - Situated 3 kms away from the City Bus Stand, this temple was built by the Ballal family of Attavar in memory of a Princess of Kerala. St. Aloysius Chapel is situated just 1 km away from the Nehru Maidan Bus Stand. It is atop the lighthouse hill,built between the 18th and 19th centuries, and see the beautiful paintings of the artist Antony Moshaini of Italy, adoring the walls of the church. It is an architectural gem, comparable with the Sistine chapel in Rome. Kadri Sri Manjunatha Temple, located on the highest foothill, and dating back to 1086 AD, which houses India's best bronze statue of the God Lokeshwara. On top of the hill King Kundavarma Bupendra built a mutt which came to be called 'Jogimutt. Lighthouse Hill Garden - It is situated 1 Km. away from Bus Stand. One can see the beautiful sea view, sunset view and also the sailing ships and boats on the sea. Ullal Darga - Known for the "Uroos Fair". This is one the main mosques in the region. Built in 1958, thousands of people from various states visit the mosque to participate in the Uroos festival which is celebrated once in every five years. Stone Caves of the Pandavas, situated 4 kms away from the Nehru Maidan Bus stand. Sultan Battery, built by Tippu Sultan and made of black stone, 6 kms away from the city at Boloor. There are other interesting spots like Panambur Beach, which is 10 kms away from the city, next to the harbour, and Ullal Beach, which is 5 kms from the city. New Mangalore Port, about 10 kms away. Prior permission is needed. Baindur is a hamlet, 45 kms from Maravanthe. It has a Beautiful Beach . Ottanane near Baindur is famous for its glorious sunset. Malpe Beach It is 66 kms north of Mangalore. The pristine beauty and peaceful surroundings, make this beach a favorite holiday spot. Dharmastala 75 kms east, this town is a unique example of communal harmony, famous for its Manjunatha Temple. Every person, who comes here, irrespective of caste or creed, is welcomed and given a free meal. Kollur is 140 kms north. The famous Mookambika Temple here, attracts thousands of devotees. Both luxury and Budget type accommodations are available. 30 kms from the city. 5 to 10 kms from the city and the other one is the terminal station Hampankatta in the heart of the city. By Road There are two Bus stations for long travel purpose.